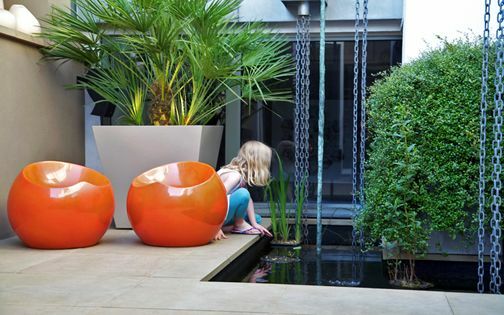 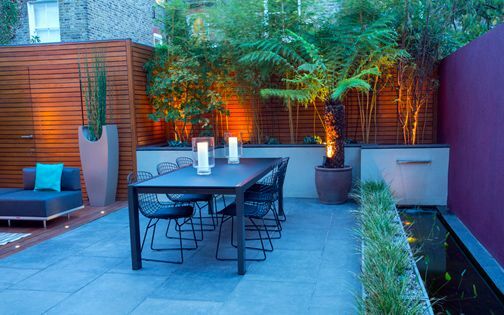 The contemporary design for this North London family garden fluidly extends a compelling, open-plan interior into a remarkably detailed architectural outdoor space. 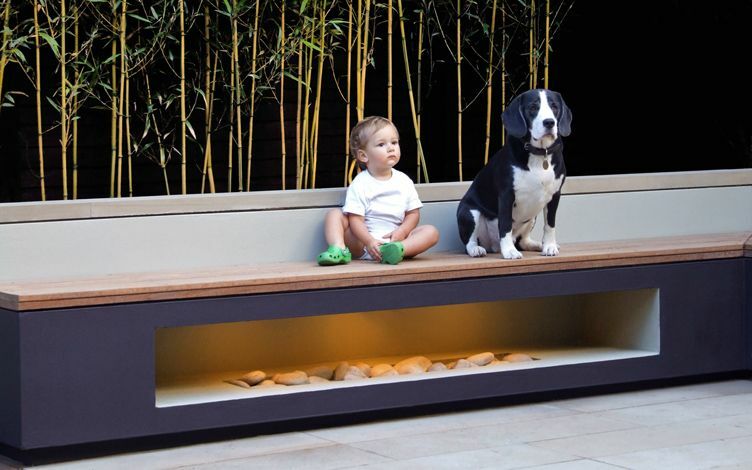 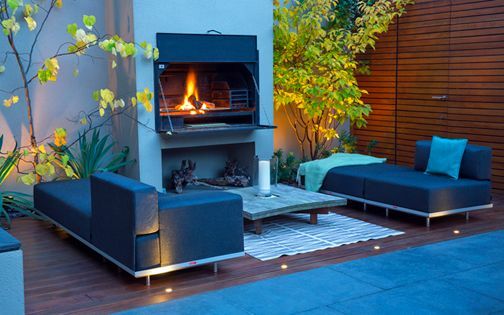 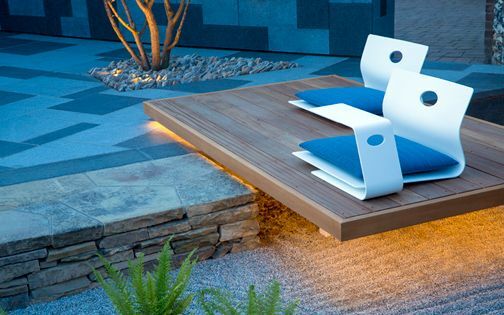 A unique corner bench design echoes the structure of an indoor fireplace, while a hardwood deck merges with the living room's flooring. 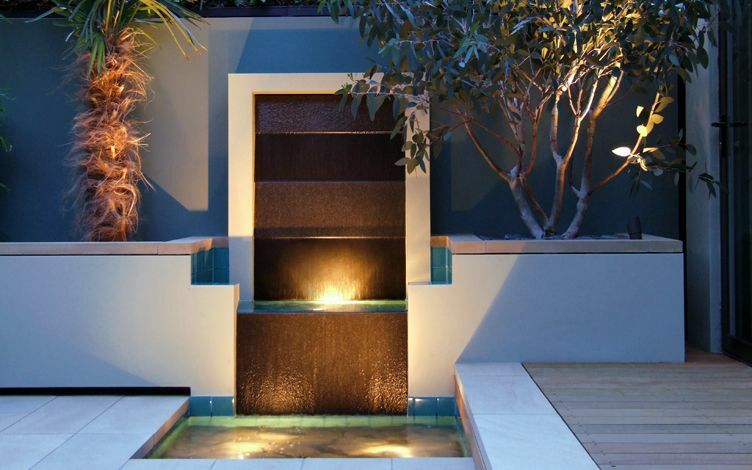 A granite waterfall produces a captivating flow, framed by the sculptural silhouettes of multi stem trees, where natural surfaces integrate seamlessly into floating raised beds, and accentuate lush, exotic foliage in an engaging family garden design. Our clients extended their living room into its adjacent garden, enhancing spatial fluidity with a spacious rooftop terrace above to accommodate further space for a growing family. 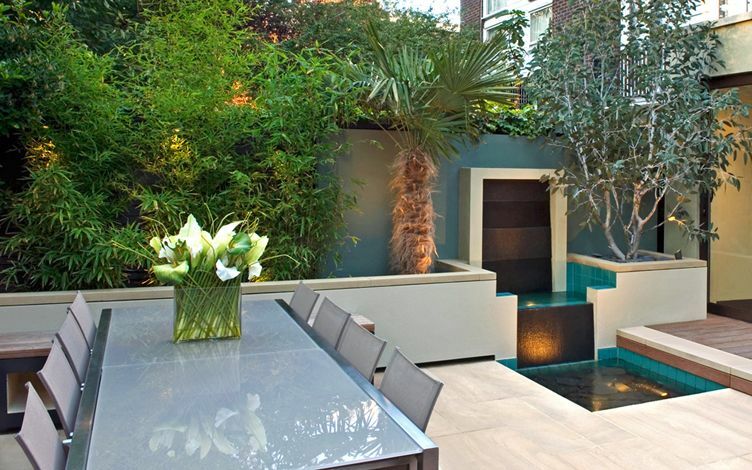 Still, the residence presented a blank outdoor canvas, including back and front gardens which required thorough transformation. 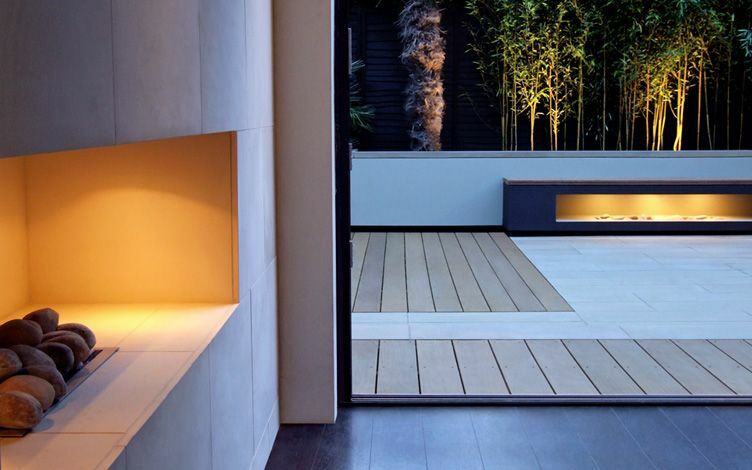 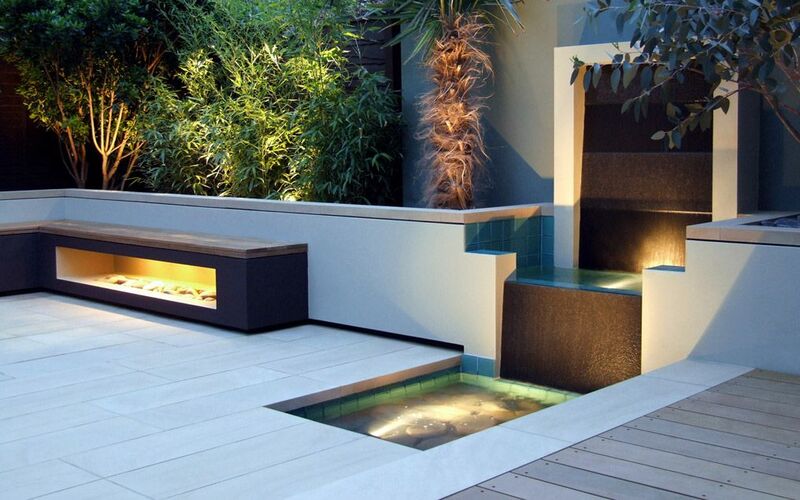 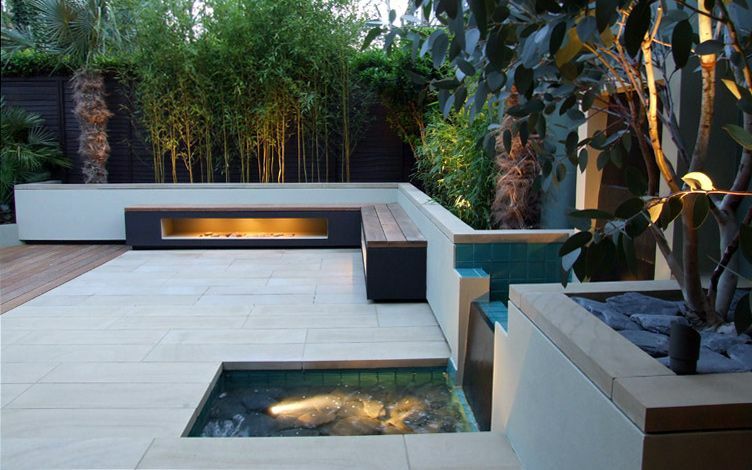 The comprehensive garden design encapsulates visual objectives set in a detailed consultation, following the interior's refurbishment, where we took inspiration from core indoor elements which steered a minimalist detail design for its exterior. 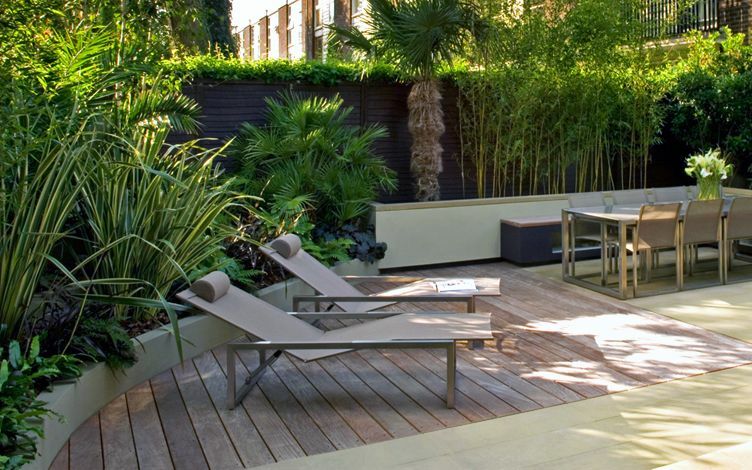 With a growing grasp of roof terrace design, we sought to integrate our versatile canon into a cohesive, contemporary outdoor scheme to provide fun amenities for the entire family. 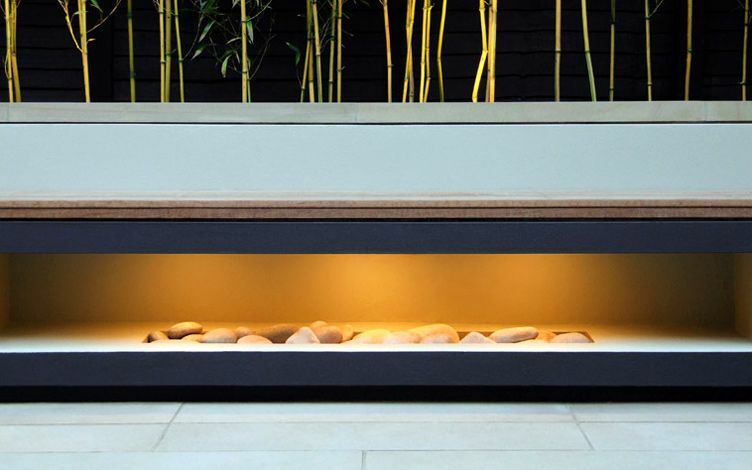 We echoed the outline of an indoor fireplace by creating a bench continuum, featuring a reciprocal aperture. 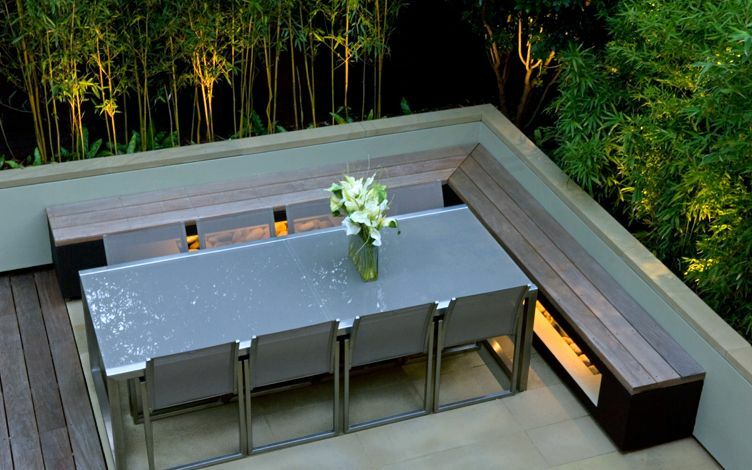 The bench design forms a central focal point from the living space, providing abundant seating for extended family and guests; its minimalist layout enhanced with colour contrast, where Bamboo canes produce vertical essence, and emerge above a warm lighting glow. 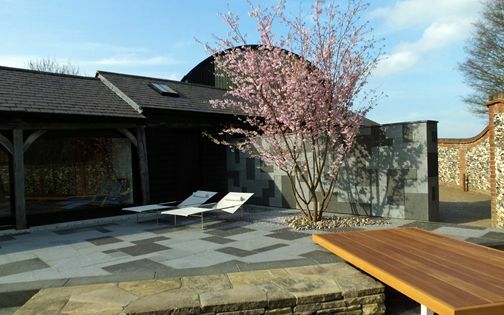 A further focal point is formed by a granite waterfall, positioned asymmetrically along the garden's right elevation. 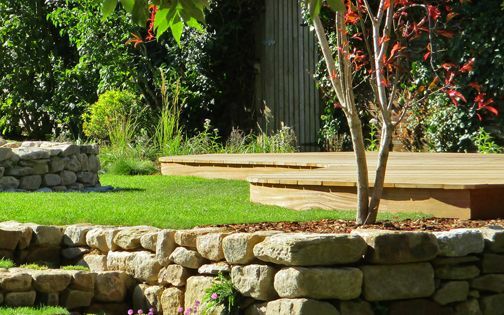 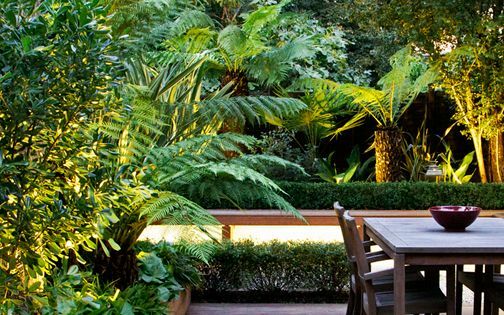 The clients are passionate about natural landscapes and contemporary garden design, supportive of our core concept which enhances a sense of moving water, within a garden enveloped by abundant foliage – evocative of their family garden in France. 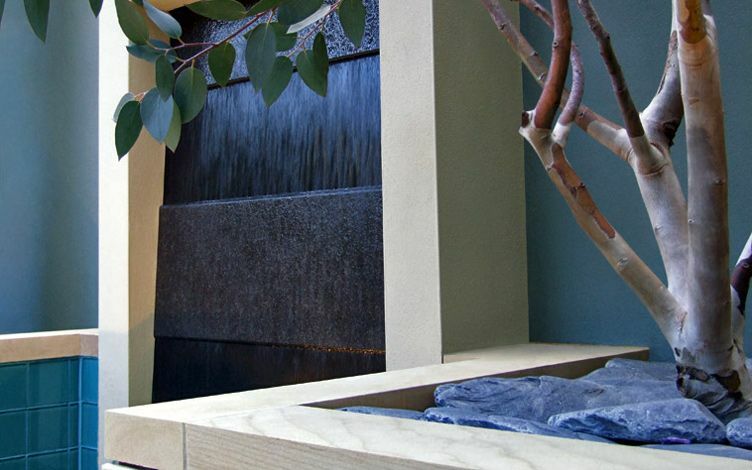 We developed an innovative construction technique during the design & build process. 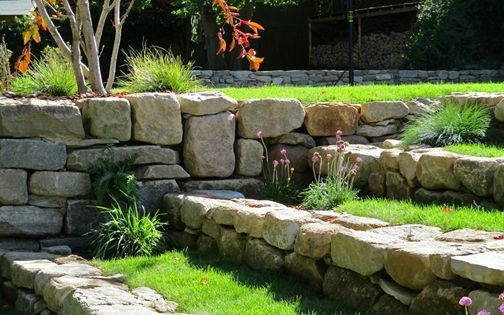 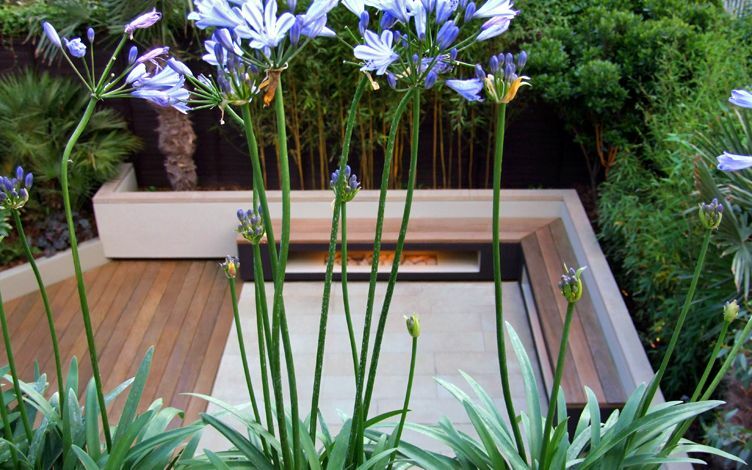 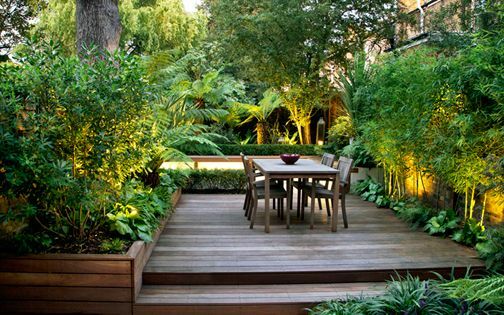 To reduce auxiliary earth, required to backfill excavation voids, and conserve garden boundaries, the plants emerge from their raised beds' substructures – defining a multidimensional light well ambience. 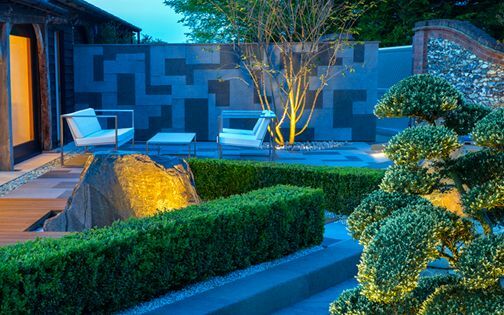 This resourceful articulation of ‘form follows function’ enhances daytime dynamics, and increases spatial depth, while producing an invigorating night-time setting. 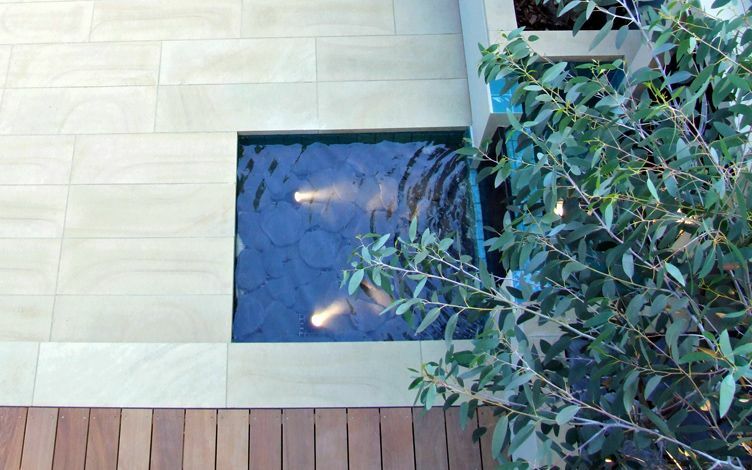 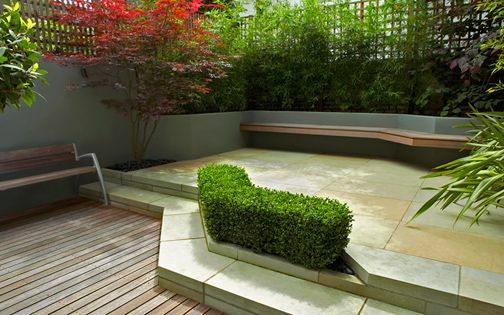 The sandstone paving was quarried at a distinctive 90 x 30cm size; its rectangular outlines augment linearity within a contemporary layout, leading views across the garden, and adding balance to accentuate a subtly layered composition, alongside Ipe hardwood decking and a fun artificial grass area for the younger boys of the family. 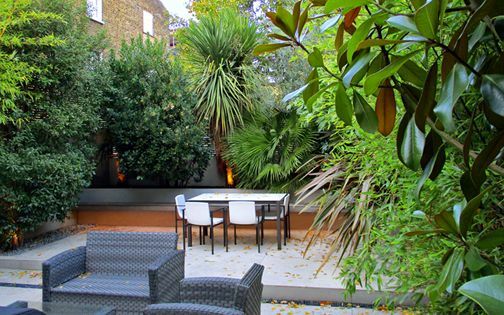 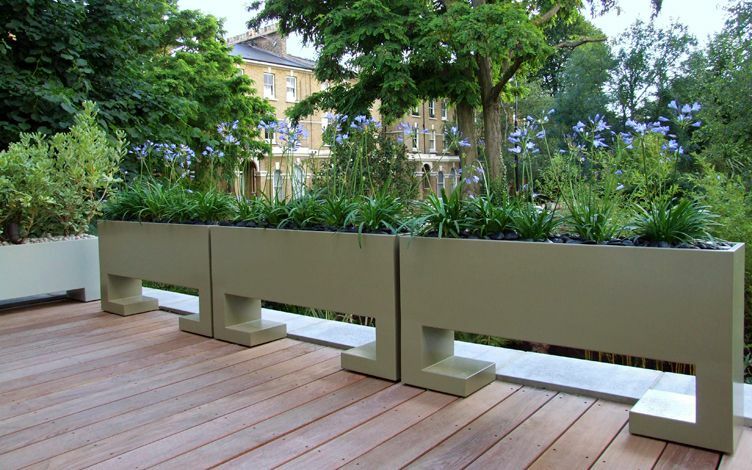 The clean-lined contemporary surfaces contrast lush foliar textures, where Yellow groove bamboo, Silver birches and diverse Palm species enhance screening towards neighbouring properties, and thrive in a north-facing aspect under overhanging mature canopies. 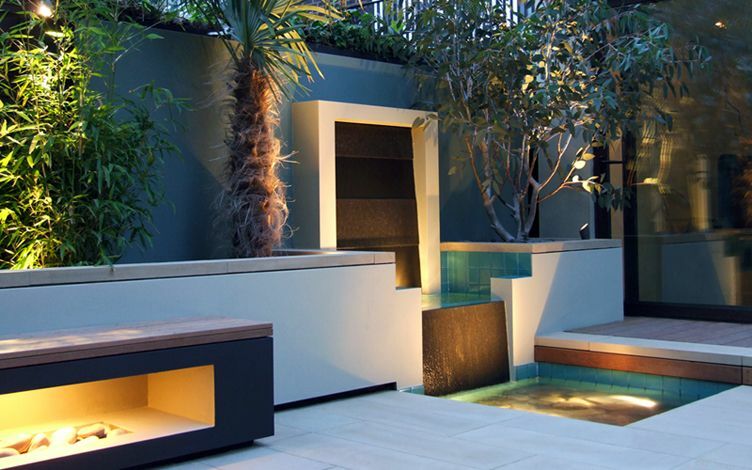 The multi-stemmed, sculptural silhouettes of Strawberry and Snow gum trees generate pivotal outlines, and produce luxuriant foliage – a signature soft landscape element of many residential North London gardens we design. 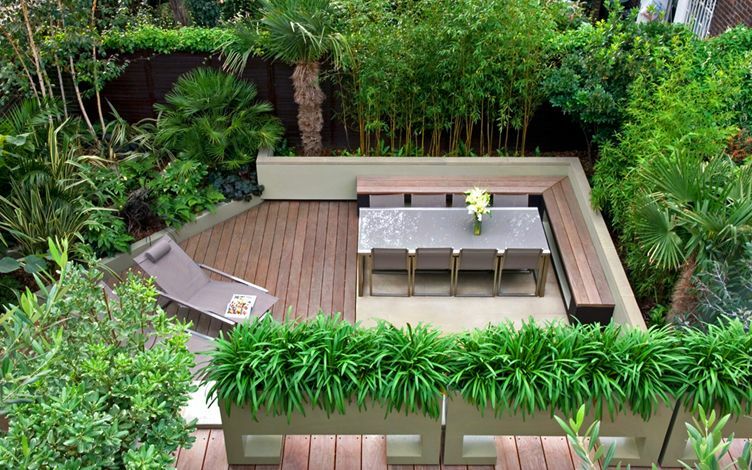 Seating is situated across from the house, providing privacy and shelter with unobstructed views of the interior, augmented by an energising roof terrace vista, where upright Bamboo canes behind the benches define a minimalist design for a contemporary family garden.